For a number of reasons & feelings, our culture will – at times – choose to ‘look away’ and not seewhat is before their eyes. At Sierra Roots, we see people that are hungry, do not have a shingled roof over their head, and have a host of challenges just to meet the basic necessities of a life…so we – along with others who assist from the community – respond & offer what we can share. 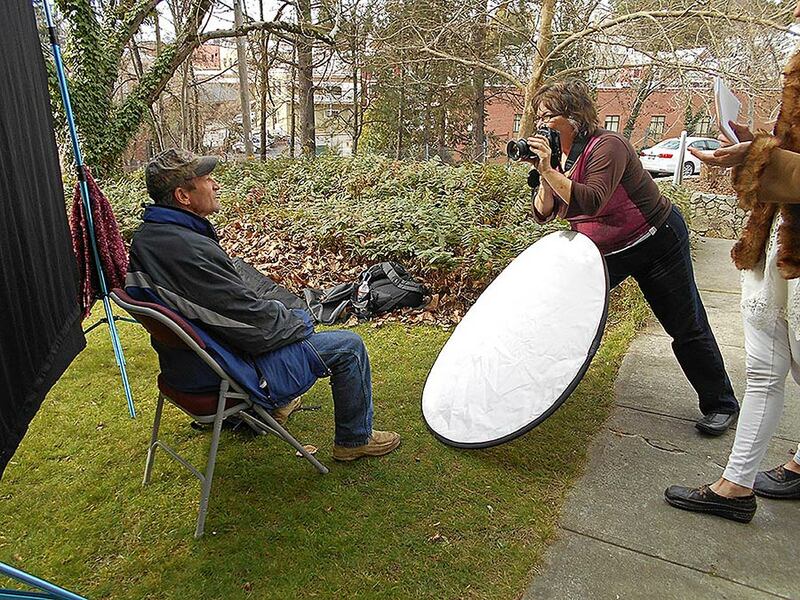 We have created a “Faces of Change” Photography Project as a way to literally ‘put-a-face’ on the homeless & the needy. Photographer Dee Anne Dinelli of Shadow Dance Photographyvolunteers her professional skills & equipment to capture these black & white portraits of some of the people within our community that have agreed to share themselves & their stories. Many people that access our services are very private with their affairs – most do not want to have their picture taken because: “What are you going to do with my photo?” or “Is this a mug-shot for the Police?” or “I don’t want anyone to know I’m homeless.” With the images you see here, we asked for their expressed permission to share their faces as a way to show you what we see on a weekly – sometimes daily – basis: the humanness of the homeless. Matthew Coulter is a disabled veteran in our community. He has been homeless for the past four and a half years. Matthew has taken on the project of attending every single City Council and Board of Supervisors' public meetings for the past six months, plus the Firesafe Council, the Grand Jury, and the Continuum of Care monthly meetings. Matthew is always on the lookout for housing solutions for our community's homeless people, and he is very much in support of the Micro-Village concept. Jeremy Lemelin lived in Florida until he came to visit his cousin in GV. Like many of us, he felt a connection with this land and, of course, the Yuba. He decided to move out here along with his aging parents. He found work and a place for them to live. All was fine until his mom got sick. He and his father took her back to Massachusetts where his brother could help with her care. She died in November. Jeremy’s dad went back to Florida and Jeremy returned to Nevada City where he thought he could find work. Building a new life for himself isn’t easy, especially with his dad and best friends so far away. He sleeps in his truck but even that needs new brakes now. He does not do drugs, tobacco, or alcohol and would qualify for Hospitality House if he had CA identification. A kind and generous soul at SPD let him use her address for a CA license. Being homeless is not easy. He plans to buy tools so he can do more maintenance work. He hopes to start with a weed whacker. When he gets back on his feet, he wants to continue to help Sierra Roots because he can see that some people need a lot more help and he likes belonging to a community. Right now he needs work. He can do light and heavy maintenance type work both inside and outside. He has also done house painting. If you have work for Jeremy, he can be reached at 530 446-5976. He has worked out well on landscape projects for Eric Jorgensen. Call for references (530 264-5113). Plans for a village include tools that would put this man to work and a support group to help him through the hard times – a hand up, not a hand out. Martin has been without permanent housing since 2003 when he lost his machine shop business in a burglary. Martin is a photographer, metal smithy, worm farmer, bicycle designer/ builder, gardener. Martin says that when people are away from the glue of buildings, they become sensitive. Perhaps he was speaking for himself and perhaps other homeless people. I think he is also a philosopher. He designs bicycles to generate electricity. They can be used for entertainment to power music systems. He remodels, repurposes bicycles for cargo transportation. He is currently working on a bicycle that will tow another bicycle so that he can deliver a them to friends. He envisions an economic engine for "purpose" not profit - to provide a new classification of housing he calls indigent housing. It may change humanity. It will create an opportunity for indigent people to care. Like all other people on earth, indigent people need something to care about. That is why pets are so important to them. This is how it works: local farmers will be supplied with worm castings in exchange for a certificate for farm produce. The certificates will be given to civil servants - mayors, city council members, etc - as a way of giving back to the community. He will have a booth at farmers markets to sell worm castings locally and on-line to sell everywhere. His farm will host a village and the village will work the farm. The farm will create jobs. Eventually, worms will be fed to fish (protein conversion) and fish fed to people. Worms reproduce rapidly and will be used by local green agriculture. He teaches about worm farming to kids at Sierra Harvest's farm. Martin says that kids have the information. He and Sierra Harvest give kids the opportunity to use that information. Then they become smart kids. Martin is helping Sierra Roots to build the tiny village in Nevada City. As a musician, Robert is on the road a lot. He lives in his truck with his dog, Peanut, who is expecting puppies soon. Since an accident several years ago, he suffers with frequent migraine headaches from a broken vertebra in his neck that was never properly treated. One morning last month he was in great pain and had a swollen jaw. He asked a friend to drive him to the emergency room as the pain was so great he did not trust himself to drive. While in the waiting room, his pain was so intense that he passed out in the chair - no one noticed. Even though he has a MediCal card, after the staff learned that he was homeless, they would not triage him. He told them about his neck and asked for x-rays so that something could be done about that condition. He also explained that his tooth was cutting into his cheek. Instead of x-rays he got a prescription for penicillin and a narcotic for pain. They sent him on his way out the door to walk alone from the emergency room to Brunswick to get the prescriptions filled at CVS. On the way, he made it as far as Mailman Drive before he passed out again, alongside the road where he vomited and wet himself. He finally made it to the pharmacy where he passed out again in the chair. Robert is a fifth generation citizen of Nevada County. His forefathers worked on the capitol building in Auburn. What does this say about the community we live in? Do we really want to live in a society that lets good people suffer like this? A tiny village would at least give this man a community where folks could look after each other. Follow up: When Robert came to the Cold Weather Shelter on Christmas Eve, he again had excruciating pain in his head - the worst headache he ever had. He told us of his plight the last time he went to the ER. We packed him up and took him to the ER again with an advocate from Sierra Roots who insisted he get some help and be looked at seriously this time. With an advocate with him, he was seen, treated and relieved of the pain, with directions to see his primary care physician as soon as possible. He then came back to the shelter for the next three days.